This film, sponsored by the Lucy Daniels Foundation, captures the intimate experience of eight artists who have had psychoanalytic treatment. The film also demonstrates the growth and freedom made possible by facing the pain that both psychoanalysis and creation bring into awareness. The artists presented in BREAKTHROUGH had found themselves held back in their lives and work because of traumatic events and unresolved emotional issues from the past. The film shows how the combination of analytic therapy and creative work liberated them. Rather than dulling an artist’s creative edge, analysis facilitates personal growth and creative freedom. 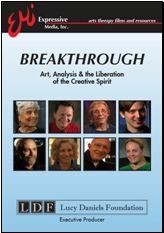 BREAKTHROUGH was commissioned by the Lucy Daniels Foundation and produced in collaboration with Expressive Media Inc., a non-profit organization founded by arts therapists and analysts Judith Rubin and Eleanor Irwin. Director: Judith A. Rubin; Editors: Connie Bottinelli, Judith A. Rubin, John Mittner; Music: Kat Epple; Sound Design: Scott Cannizzaro; Narrator: Dan Aron; Camera: Doug Emmett, Joe Frieda, Henry Joost, Ariel Schulman, Jay Spain, Bruce Wittman, Ted Yasi; Consultants: Barry M. Cohen, Lucy Inman, Eleanor Irwin, Zac Stuart-Pontie. Total Running Time: 51 min and Copyright © 2011 Lucy Daniels Foundation, Inc.